(1:05 p.m. EDT) -- With christening ceremonies that spanned Germany, Portugal and Switzerland, Viking River Cruises added seven new ships to its continuously growing river fleet. 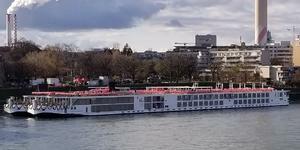 A group of Viking employees, journalists, travel agents and other invited guests gathered pierside Tuesday in Basel, Switzerland, for the event, which saw two ships christened live and an additional five christened in other countries; those namings were simulcast on large screens in Basel. Viking Einar and Viking Sigrun were christened in Basel, while Viking Vali and Viking Tir were named in Brunsbuttel, Germany; Viking Sigyn and Viking Ullur were named in Rockstock, Germany; and Viking Helgrim was named in Porto, Portugal. For the occasion, the ships were decked out in bright red and white balloons, colors that match the company's logo. Mild temperatures and blue skies greeted attendees, who took in the ceremony atop Viking Einar. 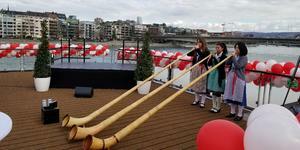 The ceremony opened with music from a trio of alpenhorn players. It was followed by a brief opening statement from Viking Chairman Torstein Hagen. "I welcome you all," said Hagen, who was flanked by the newest ships' godmothers. With seven ships come seven godmothers, and Viking selected a group of women comprising longtime employees or "important members of the company's family." First up Tuesday was Rikke Semb Pertile, Viking's senior manager of the ocean fleet's entertainment and enrichment, who hit the button for Viking Sigyn. She was followed by Linh Bahn (Viking Ullur), a longtime member of the Viking executive management team; Minxuan Zhao, who has helped the line design ships for the Chinese market and delivered the blessing in Mandarin (Viking Vali); Gisela Ruckert, who works on Viking's operations team (Viking Tir); Natalia Hofmann, a fashion entrepreneur married to Tony Hoffman, the line's executive vice president for its river arm (Viking Helgrim); Wendy Atkin-Smith, managing director of Viking's UK operations (Viking Sigrun); and Leah Talactac, executive vice president, group controller and chief accounting offers of the Viking Group (Viking Einar). 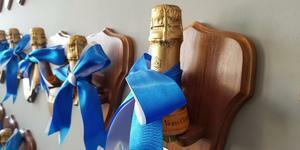 The naming, or christening, ceremony is an important part of maritime tradition. Modern christening ceremonies are designed to honor and celebrate the vessel and bring good fortune to those who sail on the ships. This is the largest number of ships Viking has christened at once since the cruise line named 12 ships in 2015. The previous year, the company set a world record, naming 16 ships in a 24-hour period. The addition of the new ships brings Viking's total of innovative Longships to 54. (Viking's entire river fleet comprises 72 ships.) Viking Longships are characterized by a unique offset-hallway design that allows the vessels to have true balconies, a rarity on the rivers. All Longships in the fleet are virtually identical in design and decor, with features including modern, elegant Scandinavian design and the Aquavit Terrace, an al fresco restaurant/lounge space. The ships can accommodate 190 people. Viking introduced its first ocean ship in 2015, with the debut of Viking Star. The current ocean fleet stands at six, with the newest, Viking Jupiter, joining the fleet just this year. The ocean ships feature many of the same design elements you'd find on the river cruise ships. In a news conference held on Viking Sigrun earlier in the day, Hagen also referenced the cruise line's new expedition ships, which will be built by Vard in Norway. While little information has been given about the new expedition ships, we do know they will be delivered in spring 2021 and 2022. Hagen also said the internal debate is whether they should be called "expedition" or "exploration" ships. Hagen also hinted the size of the ships would be larger than what some other expedition lines offer so as to keep people comfortable in rougher seas, which expedition ships invariably visit. He described them as, "Reasonably sized ships, with good equipment to stabilize. If you're on a very small ship, you can be bounced around."